PERSONAL DATA: Born October 5, 1929, in Seattle, Washington. Married to the former Barbara J. Field of Seattle, Washington. Two daughters and four sons (one deceased). He enjoys water skiing and golf. EDUCATION: Graduated from North Kitsap High School, Poulsbo, Washington; received a Bachelor of Science degree in Chemistry from the University of Washington in 1951. ORGANIZATIONS: Fellow, American Astronautical Society; Associate Fellow, Society of Experimental Test Pilots; and Navy League. SPECIAL HONORS: Awarded the NASA Distinguished Service Medal, NASA Exceptional Service Medal, two Navy Distinguished Flying Crosses, Navy Astronaut Wings, the Navy distinguished Service Medal, Institute of Navigation Award for 1969, Godfrey L. Cabot Award in 1970, the Rear Admiral William S. Parsons Award for Scientific and Technical Progress, 1970; Phi Sigma Kappa Merit Award, 1966; NASA MSC Superior Achievement Award; NASA Group Achievement Award; FAI Record.1961 (Transcontinental Speed Record); and FAI World Record (Altitude Record, Gemini XI). COMMUNITY ACTIVITIES: Gordon has served as Chairman and co-Chairman of the Louisiana Heart Fund, Chairman of the March of Dimes (Mother’s March), Honorary Chairman for Muscular Dystrophy, and Board of Directors for the Boy Scouts of America and Boys’ Club of Greater New Orleans. Gordon, R. F., F4H-1 NAVY PRELIMINARY EVALUATION, Phase I, NAS Patuxent River, Maryland, September 1958. Gordon, R. F., FJ-4B FUEL CONSUMPTION AND PERFORMANCE REPORT, Flight Test, NAS Patuxent River, Maryland, 1958. Gordon, R. F., F11F FUEL CONSUMPTION AND PERFORMANCE REPORT, Flight Test, NAS Patuxent River, Maryland, 1958. Gordon, R. F., REVISED ROLL PERFORMANCE REQUIREMENTS FOR MIL-SPEC-F-8785. All Aircraft in Configuration PA, Flight Test, NAS Patuxent River, Maryland, 1958. Gordon, R. F., F8U SPIN EVALUATION REPORT, Flight Test, NAS Patuxent River, Maryland, 1959. Gordon, R. F., GEMINI XI, GEMINI PROGRAM MISSION REPORT, NASA Manned Spacecraft Center Report, October 1966. Gordon, R. F., APOLLO XII MISSION REPORT, NASA Manned Spacecraft Center Report, December 1969. EXPERIENCE: Gordon, a Navy Captain, received his wings as a naval aviator in 1953. He then attended All-Weather Flight School and jet transitional training and was subsequently assigned to an all-weather fighter squadron at the Naval Air Station at Jacksonville, Florida. In 1957, he attended the Navy’s Test Pilot School at Patuxent River, Maryland, and served as a flight test pilot until 1960. During this tour of duty, he did flight test work on the F8U Crusader, F11F Tigercat, FJ Fury, and A4D Skyhawk, and was the first project test pilot for the F4H Phantom II. He served with Fighter Squadron 121 at the Miramar, California, Naval Air Station as a flight instructor in the F4H and participated in the introduction of that aircraft to the Atlantic and Pacific fleets. He was also flight safety officer, assistant operations officer, and ground training officer for Fighter Squadron 96 at Miramar. Winner of the Bendix Trophy Race from Los Angeles to New York in May 1961, he established a new speed record of 869.74 miles per hour and a transcontinental speed record of 2 hours and 47 minutes. He was also a student at the U.S. Naval Postgraduate School at Monterey, California. He has logged more that 4,500 hours flying time–3,500 hours in jet aircraft. NASA EXPERIENCE: Captain Gordon was one of the third group of astronauts named by NASA in October 1963. He served as backup pilot for the Gemini 8 flight. On September 12, 1966, he served as pilot for the 3-day Gemini XI mission–on which rendezvous with an Agena was achieved in less than one orbit. He executed docking maneuvers with the previously launched Agena and performed two periods of extravehicular activity which included attaching a tether to the Agena and retrieving a nuclear emulsion experiment package. Other highlights accomplished by Gordon and command pilot Charles Conrad on this flight included the successful completion of the first tethered station-keeping exercise, establishment of a new altitude record of 850 miles, and completion of the first fully automatic controlled reentry. The flight was concluded on September 15, 1966, with the spacecraft landing in the Atlantic–2 1/2 miles from the prime recovery ship USS GUAM. Gordon was subsequently assigned as backup command pilot for Apollo 9. He occupied the command module pilot seat on Apollo 12, November 14-24, 1969. Other crewmen on man’s second lunar landing mission were Charles Conrad, spacecraft commander, and Alan L. Bean, lunar module pilot. Throughout the 31-hour lunar surface stay by Conrad and Bean, Gordon remained in lunar orbit aboard the command module, “Yankee Clipper,” obtaining desired mapping photographs of tentative landing sites for future missions. He also performed the final re-docking maneuvers following the successful lunar orbit rendezvous which was initiated by Conrad and Bean from within “Intrepid” after their ascent from the moon’s surface. All of the mission’s objectives were accomplished and Apollo 12 achievements include: The first precision lunar landing with “Intrepid’s” touchdown in the moon’s Ocean of Storms; the first lunar traverse by Conrad and Bean as they deployed the Apollo Lunar Surface Experiment Package (ALSEP), installed a nuclear power generator station to provide the power source for these long-term scientific experiments, gathered samples of the lunar surface for return to earth, and completed a close up inspection of the Surveyor III spacecraft. The Apollo 12 mission lasted 244 hours and 36 minutes and was concluded with a Pacific spashdown and subsequent recovery operations by the USS HORNET. Captain Gordon has completed two space flights, logging a total of 315 hours and 53 minutes in space–2 hours and 44 minutes of which were spent in EVA. He served as backup spacecraft commander for Apollo 15. 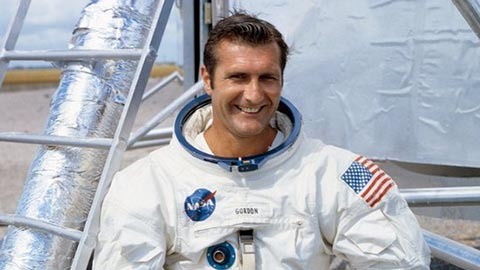 Captain Gordon retired from NASA and the USN in January 1972. Since then he has served as Executive Vice President of the New Orleans Saints Professional Football Club in the National Football League (1972); was General Manager of Energy Developers, Limited (EDL), a Texas Partnership involved in a joint venture with Rocket Research Corporation for the development of a liquid chemical explosive for use in the oil and gas industry (1977); President of Resolution Engineering and Development Company (REDCO) which provided design and operational requirements for wild oil well control and fire fighting equipment onboard large semi-submersible utility vessels (1978); following REDCO merger with Amarco Resources, Gordon assumed the additional duties of Vice President of Marketing, Westdale, an oil well servicing subsidiary of AMARCO operating in North Central Texas and Oklahoma, and also served as Vice President for Operations, Texas Division (1980); served as Director, Scott Science and Technology, Inc., Los Angeles Division (1981-1983). In March 1982 he became President of Astro Sciences Corporation. This company provides a range of services including engineering, project management, project field support teams, to software and hardware system design for control room applications. In the Summer of 1984, Gordon was a Technical Advisor for and played the part of “Capcom” in the CBS mini-series ‘Space’ by James A. Michener.